Last friday morewind moved into its new office. You can now find us here: Friedrichstraße 11, D-18057 Rostock! Some days ago, morewind successfully participated in one of the most important exhibitions within the German wind energy market, the HUSUM Wind 2015. Those who missed the presentation performed by morewind together with PHOENIX CONTACT Deutschland GmbH at the supplier forum, can find the German version concerning the topic “Optimisation of wind turbines through intelligent components and control systems” now here! 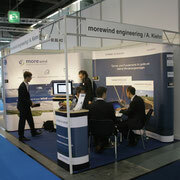 The team of morewind would like to thank all trade visitors and its co-exhibitor Andreas Kiehn! From 15.-18. September 2015, 600 exhibitors from around 24 countries come together at the HUSUM Wind 2015. morewind also participates at the leading biennial trade fair, which is one of the leading exhibitions within the German wind energy market! The main focus is set on our installation focusing on the topic “Hardware-in-the-Loop”, the presentation of our service portfolio and company product “mwLoADS”. Visitors are also encouraged to push the red button at our booth and find out what happens! Another highlight: On 16 September at 4 pm , we will attend the supplier forum together with PHOENIX CONTACT Deutschland GmbH to talk about the important issue “Optimisation of wind turbines through intelligent components and control systems”. Find out more at HUSUM Wind 2015 in hall 3, booth A28! morewind has developed mwLoADS, a toolbox for load simulation, that enables an efficient wind turbine engineering process. The company product is based on the leading open source software FAST from NREL and was already used in several wind turbine design projects including certification. Its main features are efficient Pre- and Post-Processing, a nice time series viewer and the ability to run load cases in parallel within a network. The toolbox is ideal for wind turbine OEM and component supplier like control system manufacturer who for example can use the toolbox as a development and test environment for new turbine control software. 16. February 2015, First LiDAR system installed successfully! 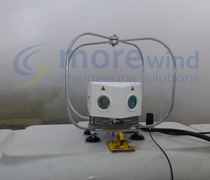 After assessing a wind park in Ireland, morewind received a follow-up order from the same client and has now installed the first LiDAR system on top of a wind turbine. The measurement technology is used to define the direction and speed in front of the turbine. After evaluating the data, the performance of the turbine can be determined and the nacelle can be adjusted optimally. Within the following weeks and months, further installations will follow to analyse and optimise the entire wind park. On 9 and 10 December, speakers and interested parties meet on the second edition of the EWEA technology workshop on “Analysis of Operating Wind Farms” in Malmö, Sweden. We are going to attend the two-day event and Arne Löhn, CEO of morewind, will perform a lecture about “Detection of aerodynamic imbalances” and present the in-house analyzing software “mwRotate”. 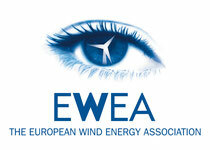 Find out more about the EWEA Workshop! morewind currently realizes a new project for a Korean company, whereas the focus is set on the drive train vibration analysis. A model of the component is built up using SIMPACK. Here, the client can directly profit from the longstanding experiences of morewind with the Multi-Body Simulation software. 4. 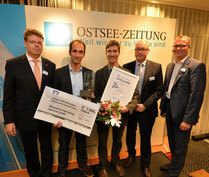 November 2014, morewind awarded for "Interesting entrepreneur's story"
The annual start-up awards, which recognize young entrepreneurship in the region of Mecklenburg-Pomeria, were presented yesterday evening by the local newspaper Ostsee-Zeitung. This year, morewind got the award in the category “Interesting entrepreneurship’s story”. The jury had to choose from 8 finalists that were picked out of 40 applications and awarded the best three concepts. We are happy about the prize and would like to congratulate all winners and nominees! The name „morewind“ indicates that wind energy is our passion. But as we also enjoy to work for other renewables, we are happy to announce our first job within the solar energy sector. The aim of the project is to get a more detailed calculation of the substructure of a photovoltaic power station by using the finite-element-method. Up-to-date FEM-software and modern technologies are necessary for a successful structural analysis and therefore an inherent part of our provided services. So now, we will bring our expertise into this upcoming new task! Last friday was the official ending of this years global on- & offshore expo, WindEnergy Hamburg: The team of morewind is looking back onto various interesting expert talks and onto professional exchange that took place within the context of the international trade fair. In cooperation with Andreas Kiehn who we shared our booth with, four successful days are lying behind us and we hope to see you again at HUSUM 2015. We are happy to announce that morewind has a new Corporate Design! The central part of the renewing is the logo which is also integrated into our over-worked website! The first project is finished and the next one already begins: After optimizing the controller and calculating the loads for a 50kW wind turbine successfully, morewind is happy about the follow-up order from the client to also perform strength calculation for the same turbine. It is an advantage for a customer when load and strength calculations come from a single source. Within this project, we are able to combine our longstanding experience in both segments. The expo “WindEnergy Hamburg” is going to start on 23th September 2014 and we are now counting down the days. Then, all visitors of the international trade fair can find us in hall 1 upper floor, booth 412. The team of morewind is looking forward to inform about our services and to professional exchange. morewind extends its service portfolio and starts to use the DNV/GL software BLADED next to FAST/AD, ANSYS and SIMPACK. The commonly known standard software for design and certification shall make the daily business more efficient. At the same time, clients in the offshore sector and other BLADED-user can be addressed directly. 13. June 2014, Expo: "WindEnergy Hamburg"
From 23.-26. September, morewind is attending the global on- and offshore expo “WindEnergy” in Hamburg. As an exhibitor, we would like to inform about our services especially in load simulation, structural analysis (with FEM) and wind farm optimisation. Furthermore, we are looking forward to many interesting conversations at our booth! 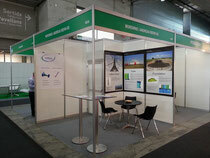 Visit us at the “WindEnergy” expo – Hall B1 upper floor, booth 412! In the future, the Autodesk software „Product Design Suite“ will be used within the company for design tasks. Thereby, we would like to provide our clients with an even more efficient service and support their individual activities with the most modern solutions. The software package complements our services in 3D product design. morewind is extending its activities abroad and will therefore be supported by MeteoPole. The company has built up a network in the Asian wind energy markets. The focus of the collaboration is to represent and promote our technologies and know how in this important and continuously expanding market and to intensify the cooperation with local firms with the help of MeteoPole. morewind got its first order in modelling and simulating offshore wind turbines. The main focus of the project is to create a model of the turbines including a substructure in BLADED based on information provided by the client. Furthermore, the work package contains performing load calculations, analyzing results and identifying possibilities for optimisation in the future. The project allows morewind to bring in its many years of knowledge and experience in load simulation. In April, morewind had the opportunity to prove its consulting competences in the field of load simulation. The aim of the project was to advise and support a client within the process of load calculation. In the context of the order, a BLADED-model which was provided with a controller dll was tested and corrected. With validating the given data, the project could be finished successfully and with great satisfaction of the client. Sunny 36°C in Madhya Pradesh, India: morewind started the cooperation with a new Indian turbine manufacturer. This time the task is to prepare, support and evaluate the blade tests according GL 2010 guideline to be accomplished for type certification. 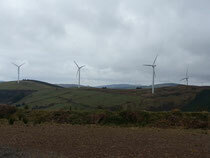 morewind is optimising a wind farm in Irland. We are performing a detailed SCADA analysis and providing inspections to that 14 turbines. morewind finished another development project doing structural analysis with Finite Element Methods for various components of a tubular tower. morewind had a booth on EWEA2014 in Barcelona. It was the occasion to present morewind for the first time to the wind industry. We took the occasion to show our blade imbalance verification tool mwRotate. It was a great experience with a lot of very good talks. Thank you to Andreas Kiehn for sharing the booth with us. The alliance with Andreas for Tower and Foundations is very complementary to the scope of morewind and enables us to provide R&D services from blade tip to foundation!